2011-09-22_21-11-30_958, a photo by ejveal on Flickr. 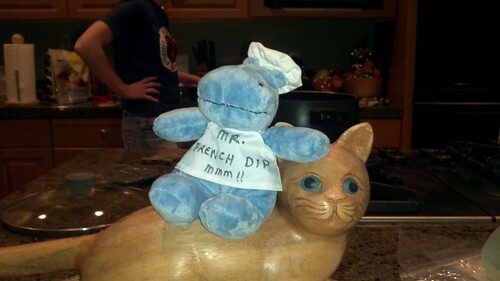 My sweet friend Nancy gave me a blue, stuffed hippo chef with a big that says Mr. French Dip. He says only one thing, "MMM!!". When I think of French dips, I think of blue hippos sitting on wooden cats.